However, while he can a bit of a killjoy at times, this Anakin Skywalker-built droid is a fluent translator and expert communicator. And, when it counts, he can be just as heroic and swashbuckling as the rest of the rebels! 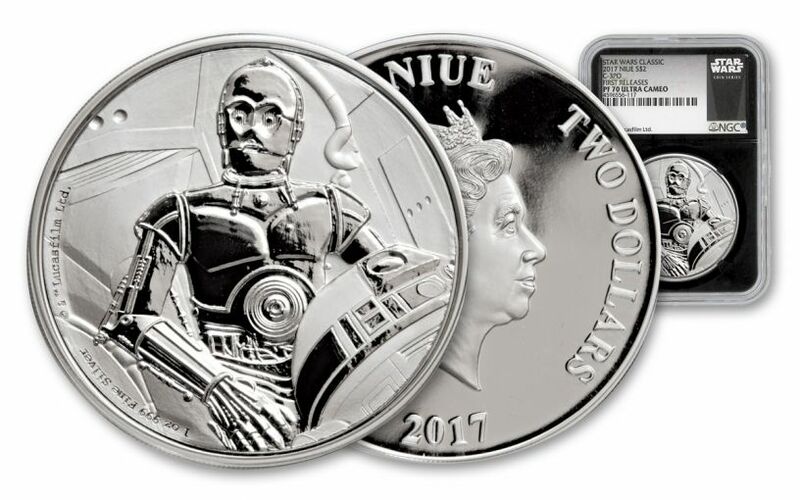 So, as the New Zealand Mint's popular Star Wars coin series continues, it's only natural to give "Threepio" his time in the spotlight, minted in stunning silver! C-3P0 IS ON TASK, BUT NOT ALONE! -- This 11th silver release in the Star Wars 2016-2017 series features our favorite 3P0 unit in mid-consultation. Superb engraving brings C-3P0 and his surroundings to life in gorgeously intricate detail. But look closely and you'll see a familiar sight -- R2-D2™ peeking in from the lower right! 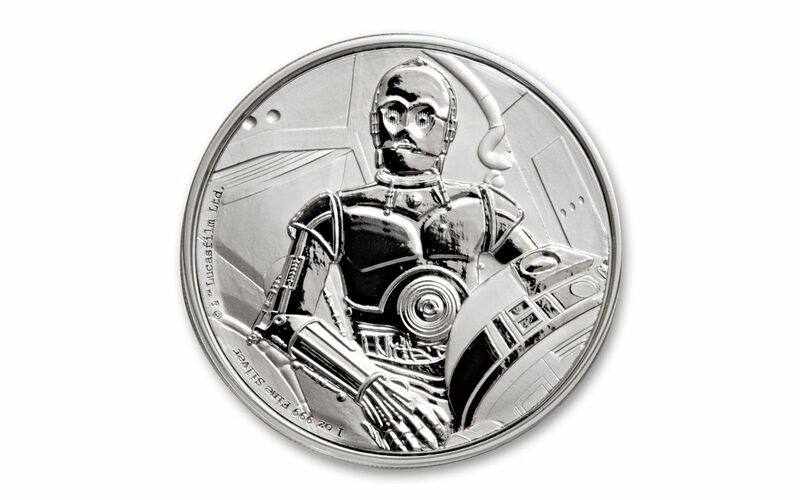 PROOF-MINTED IN HIGHLY PURE SILVER -- The artisans at the New Zealand Mint are known for creating gorgeous works of art, and these C-3PO coins are, quite literally, proof! Each beginning as a hand-selected planchet of 99.9% fine silver, these one-ounce proofs are struck multiple times by polished dies, resulting in razor-sharp, frosted details that float over mirror-like fields. OFFICALLY LICENSED NIUE LEGAL TENDER -- Your 2017 proof is officially licensed by Lucasfilm Ltd. -- a distinction that's stamped right into the coin! 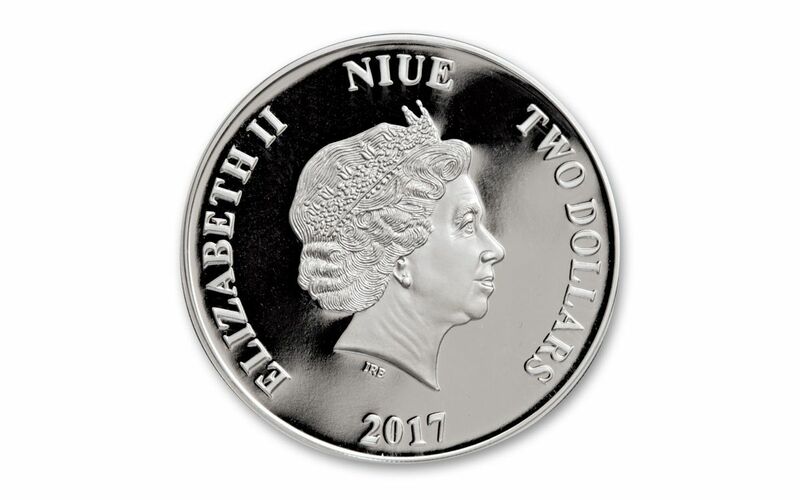 In addition, your proof is two dollars legal tender for the island nation of Niue, a fact reflected on the obverse along with Ian Rank-Broadley's profile of Her Majesty Queen Elizabeth II. CERTIFIED PERFECT -- Your coin will come graded Proof-70 Ultra Cameo (PF70 UC) by Numismatic Guaranty Corporation (NGC), a distinction that means your perfectly-graded 2017 Silver Star Wars C-3P0 Proof will have ZERO imperfections -- showing all features and fields exactly as the engraver and mint intended! In addition, your proof will be certified First Releases (FR) by NGC, meaning that it was among the first struck by the mint and was verified within the first 30 days of issue. Your proof will also be sonically sealed in an acrylic case with a special Star Wars label and black display core, giving you the best in protection and visual contrast while granting clear sightlines into every beautiful detail. Finally, your proof will arrive to you inside a black drawstring pouch with an official New Zealand Mint certificate of authenticity and all of the proof's original Star Wars-branded packaging! 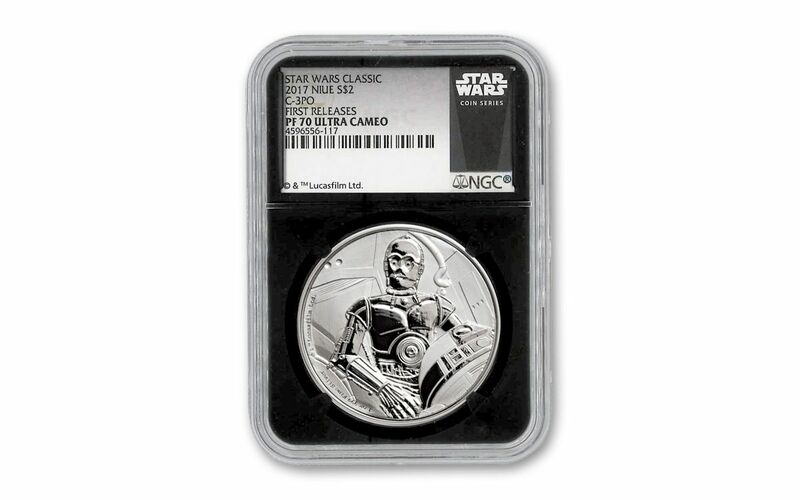 LIMITED MINTAGE PROOF -- Only 10,000 of these proofs will be minted for a galaxy of Star Wars fanatics! The New Zealand Mint has been issuing amazing Star Wars proofs over the past several years, many becoming fast favorites among collectors. Entries from this 2016-2017 series of galactic heroes and villains have already sold out at the New Zealand Mint. Whether you're looking to grow your collection or score this fan-favorite on its own, don't wait before this opportunity disappears as well -- secure your own 2017 One-Ounce Silver Star Wars C-3P0 Proof now!